Can Preparing for the SAT Really Help Increase Your Score? 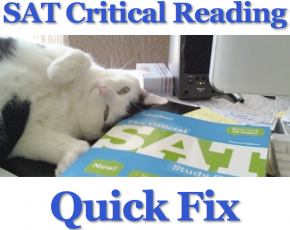 You are here: Home / Key Posts / Can Preparing for the SAT Really Help You Increase Your Score? Yes. The combination of a motivated student and a highly skilled coach can produce dramatic results. There’s been a lot of press recently that suggests that getting your child professional help to prepare for the SAT doesn’t help all that much. The National Association for College Admission Counseling (NACAC) released a study the other day entitled, “Preparation for College Admissions Exams.” According to NACAC, students, and their parents, should expect only a small gain in test scores in the neighborhood of 30 points. The College Board backs up their claim. The study is very misleading. Now I don’t want to knock college admissions counselors, because your child’s college counselor is a very important ally when it comes to getting into college. But if you heard about it on the news and you’re thinking, “Well, if it’s not going to help much anyway, why waste my kid’s time and my money,” you might be doing your child a great disservice. Here’s the problem with their study. When they say, “average gains are more in the neighborhood of 30 points,” they don’t tell you that the term “average” is meaningless. I don’t doubt that if you averaged together all of the students who did any kind of paid test preparation you might get an average increase of 30 points. What that doesn’t account for is all the kids who got a book or an online course and didn’t use it, all the kids who took an SAT class and didn’t pay attention, all the kids who had a tutor who wasn’t really that skilled, and all the kids who didn’t really want to study but their parents made them do it anyway. The truth is that the combination of a motivated student and a highly skilled coach can produce extraordinary results. I’m talking about a 300 point increase in 12 weeks, and a 400 to 500 point increase in 40 weeks. Most people are capable of doing far better than they ever imagined. The real question isn’t whether it’s possible, it’s how to achieve it. I’ve been coaching kids for the SAT’s and other college admissions tests for 9 years, and during that time I’ve learned a lot about how people learn and what gets in the way of learning. I look forward to sharing it with you. Great post. It’s really helpful to deconstruct “average” and why it can be so misleading. I look forward to your future thoughts on what *good* test preparation means and the impact it can have not only on scores but on self esteem and confidence.